New techniques in data visualization are revealing connections and relationships that were previously hard to perceive. It feels like everyone is talking about data visualization at the moment. In health economics and outcomes research (HEOR), the focus is on how presenting research findings visually is making results more accessible and perhaps even facilitating a better understanding of them. But is this really true, or are we just dumbing things down? At Broadstreet we believe that visualizations do have a role in clarifying complex data, and a network meta-analysis (NMA) we recently published provides an interesting case study. NMAs facilitate assessment of the efficacy or safety of treatments that have not been compared directly. As such, they have become an increasingly important tool for consolidating and interpreting patient outcomes across diverse sets of treatments. However, they are complex, requiring the simultaneous consideration of numerous inputs and outputs, potentially over many iterations of the analysis. Multiple analytic approaches are undertaken for each network and this can produce an amount of outputs that are difficult to engage with, especially for non-experts. Fortunately, data visualization can help. Our study compared the efficacy and relative safety of two pharmacotherapies for the treatment of overactive bladder (OAB). In the treatment of OAB, mirabegron and onabotulinumtoxinA (botox) have both been found to be efficacious relative to standard-of-care therapies, although they have not been compared head-to-head. Previously published NMAs have focused on efficacy only and have not sufficiently accounted for important population differences in patients with OAB across trials. Our study is the first to compare the efficacy and safety of mirabegron and botox in the management of treatment-experienced patients with OAB. This is important because clinical trials studying the efficacy and safety of mirabegron may include both treatment-naïve or treatment-experienced patients, while patients in trials of botox are generally treatment-experienced. Previous comparative efficacy work compared a heterogeneous (treatment-naïve and treatment-experienced population) mirabegron population to a homogeneous (treatment-experienced) botox population. These differences in patient populations may lead to important differences in treatment prognosis and thus make comparisons less valid. Displaying the inputs and outputs of any NMA can require comparing numerous tables and figures in a standard report. 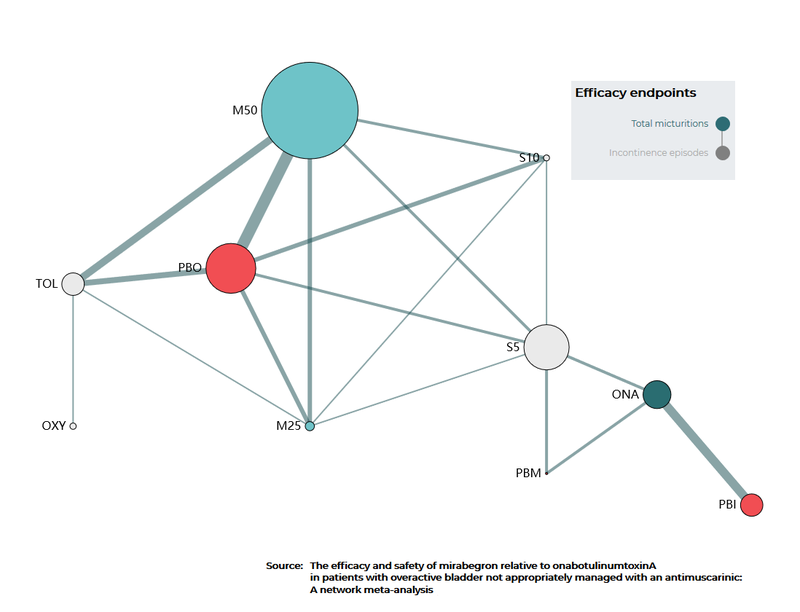 However, with data visualization tools you can quickly see and understand the evidence network – which treatments are compared to what. Visual cues like thickness of the edges (lines) or the size of the nodes (circles) can be used to effectively communicate information. Users can understand which comparisons are indirect and which are direct; and how results vary based on the type of evidence considered. The data visualization tool we created allows users to interact with the efficacy and safety data compared between the two treatments. The number of studies and patients considered in each comparison, as well as the source of evidence, are easily identified, to facilitate understanding of the importance of statistically significant differences noted between treatments in the forest plots. Users can toggle between viewing the evidence network and NMA results; as well as chosen efficacy endpoints. The display can be customized for different users, to allow high-level summaries for less technically-inclined stakeholders; but allowing those who are more technically inclined to drill down to the underlying data. If done correctly, we believe a data visualization app can be a powerful tool to communicate study findings because drawing people in to interact with the data helps to facilitate understanding of what is being presented. Beyond that, the visual medium makes the information accessible to a wider audience, with the results being disseminated to and understood by, not just the research team but also those whose job it is to turn those findings into value in the marketplace. This is particularly important with an NMA because while in spreadsheet form, the most relevant results don’t always jump off the page, with a visualization that is exactly what they do. Check out more demos of our data visualization tools.